This new anime by director Shinkai Makoto has prompted comparisons with the great successes of Studio Ghibli and specifically with the work of Miyazaki Hayao. It isn’t difficult to understand the comparisons. The narrative deals with adolescents, both of whom have the potential for heroism. 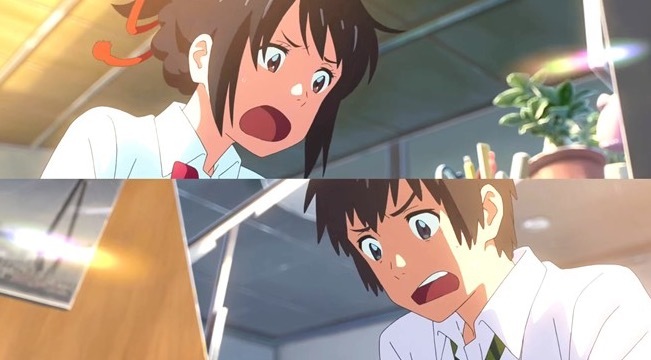 Mitsuha lives in a small town in the mountains but Taki lives in Tokyo. Mitsuha is a typical Ghibli young female, living with her grandmother and younger sister and estranged from her father, the town mayor. Her late mother had inherited her own mother’s spiritual powers and Mitsuha is expected to follow the family tradition, tending a shrine and helping her grandmother who weaves braids for ceremonies. But Mitsuha wants to try something different: she wants to experience Tokyo and the kind of lives that boys have. In Tokyo, Taki is a high school boy with excellent drawing skills and a part-time job in an Italian restaurant where he has a crush on an older co-worker. Writer-director Shinkai Makoto has fashioned a narrative that enables these two adolescents to interact and learn from each other — using a mixture of romance, fantasy and adventure in new ways, even if the device of switching identities is familiar from universal romance/fantasy genres. But what starts and perhaps ends as one kind of film takes a very different turn part way through and moves into the kind of discourse familiar from manga and anime. As well as Ghibli, I was reminded of The Girl Who Leapt Through Time which is a case study film in The Global Film Book. That film used science fiction to create a narrative around one adolescent’s discoveries about herself. In Your Name, although it is first fantasy that brings the couple together, there is also a real interest in science — and in the natural disasters which befall Japan. The animation is detailed and sometimes very detailed. I enjoyed the music too, though I know there are critics of the pop group Radwimps. It is no surprise that this has become one of the biggest box office hits of all Japanese cinema and the only anime to challenge Miyazaki. (I should be clear though — this is not a Ghibli film.) If this film could charm me on a long haul flight, I’m sure it would be an emotional storm on a big screen. If you haven’t seen it yet, look out for the Japanese language version. This entry was posted in Animation, Japanese Cinema, Romance and tagged anime, fantasy. Bookmark the permalink.